Those of you who follow my blog know that I have been conflicted about voting, but go and do it anyway, most of the time, e.g., in November 2011 for the municipal election and in November 2012 for the general election, when I felt there were some politicians very important to vote against. In April 2012’s general primary, however, I was sufficiently apathetic that I didn’t bother voting, although Abby did. For that election, it seemed to me that the winners were all going to be obvious no matter what I did, and there were no close races where I really cared about who won. I feel that in the absence of an informed opinion, the only rational and moral thing to do is to stay out. It is unfashionable in our society to admit “I don’t know”, but if I truly don’t know, then I see no point in participating. Primary elections are particularly problematic for me, because I simply oppose the concept and also resent being forced to register for one of the two major American political parties. May 2013 municipal primary: choosing mayor! But this year’s Democratic primary is critical, because it will basically determine who becomes the next mayor of Pittsburgh, given that a Democrat will win in the general election in November. And since Luke Ravenstahl decided to step down, there is a possibility of real change. So I was pretty excited to vote today to make a difference (I hope). 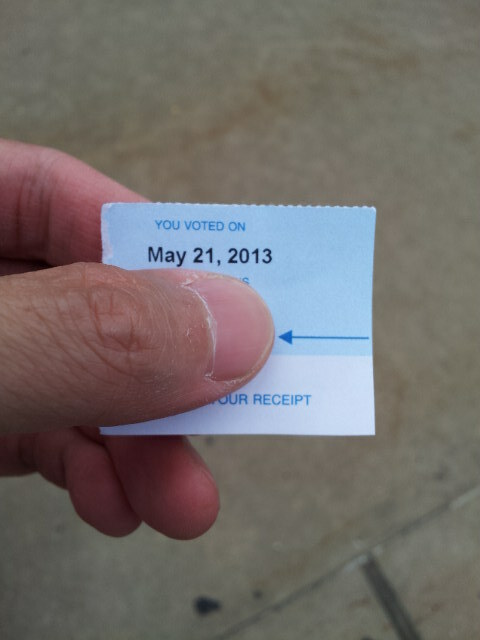 This will be the first time I have voted for a mayoral candidate in a primary in my 15 years as a Pittsburgh resident. For once there may be a crack in the rusty Democratic political machine here? Voter turnout today has been crazy low. There was no line whatsoever when I went to vote or when Abby went. I’ve never participated in an election, I think, with such low turnout. I avoided most media coverage of the election (hard to avoid everything completely, admittedly) until I had already voted. (Yes, that includes ignoring the basically meaningless “endorsements” of the Post-Gazette and Tribune-Review. Then I enjoyed reading this little look at what’s been going on with the mayoral race. And tomorrow I am back to ignoring the news. Also, I had to recycle probably 30 or so paper flyers during election season. What a waste. And summarily delete dozens of robocalls on the answering machine. Note to everyone who sent me junk or left junk messages on my answering machine: I did not read a single thing you sent, or listen to a single word you spoke; your junk only made me angry and at least partly less likely to vote for you, if I caught your name and remembered it. Pathetic. I realize this crap works on some people, but I’m afraid it doesn’t work on me: I’m not going to believe that your opponent eats children for breakfast, no matter what large fonts you use. In a moment of relief from apathy and cynicism about politics, I eagerly voted today. I hope I’ll get to see whether I was justified.